John Knox is Needed Today! Our church recently hosted the "John Knox Men's Fellowship." This organization has been around for 70 years in West Tennessee. This recent gathering was the largest yet -- over 120 men. Our guest speaker was our good friend and fellow ARP Pastor, Rev. Christopher Neiswonger. He set the context for the faith, life, and ministry of John Knox, the figure head of Scottish Presbyterianism. The presentation was engaging and hopefully the subject of a future video seminar. The clear points taken are summed up in a quote attributed to Knox, "Resistance to tyrants is obedience to God." ​While the scriptures call Christians to live a quite life, and to pray for kings, there is a corresponding tension of standing up and resisting the attempts of rulers and governments who would supplant the authority of the church to disciple the nations. While Presbyterians acknowledge the separation between church and state, we get a little concerned when the tensions held by these two authorities become awkwardly co-mingled. For example, the history of England brought about the establishment of a 'state-church' over which the monarch presided as an authority; but the state is not a "word and sacrament" operation! Too often, the monarchy would selfishly select church leaders to fulfill their own personal objectives that had nothing to do with advancing the Kingdom of Christ (and this so routinely that the flocks of God throughout Britannia would protest leaders who knew not the Great Shepherd of the sheep that they were often regarded as seditious by the monarchy)! The church is a greater Kingdom that exists among the citizens of all nations; but her primary call is upon the devotion and destinies of her members. Therefore, the church would never advance Christ's Kingdom in a way that states are permitted: force, taxes, prisons, and swords. Much of this type of debate came to influence the founding of the United States of America (see article below). But we now seem to live in a time when the "state" (mostly a federal one) is demanding more allegiance of the church then has ever existed in our first 200+ years of existence. Even as I write this, I can imagine a government employee happening upon this blog to report me for stating that loyalty to Jesus Christ and his word is more important than obeying the "new morality" advocated by public schools, federal agencies, and "supreme courts." Report away. I will resist this ungodly indoctrination and I will refuse to goosestep to any states sinful standards. As one Christian stated before a ruling council, "We must obey God rather than men." (Acts 5:29). ...first uttered by Scottish Reformer, John Knox, struck a chord with many famous leaders who followed. It was again quoted by Jefferson, Franklin, and even Susan B. Anthony. This slogan was proposed to appear on the back side of the Great Seal of the United States. The repeated use of the phrase indicates that a huge dose of "Presbyterian theology" has been infused into the American psyche. Knox first studied to become a Roman Catholic priest; but the ministry of Protestant evangelist, George Wishart, brought the saving gospel to Knox. Knox accompanied Wishart as a body guard because Protestants were being persecuted. Eventually, Wishart was executed, and Knox became a galley slave. Knox escaped to Geneva to train under John Calvin. Backstory on the political front: King Henry VIII broke away from the Roman Catholic Church. He established the Anglican Church and appointed ministers who promoted His monarchy. Henry essentially became a different stripe of Papal authority. Henry's successors also marshaled armies to support whichever religious conviction they held. The established Roman teaching of, "always submit to earthly authority" was leaving too many dead, and too many rulers beyond any check or balance. Knox returned to Scotland and met with Mary Queen of Scotts, where she accused him of inciting rebellion against her rule. Knox replied that history records, from the Bible through all of Western Civilization, many famous men who were often at odds with their society and culture for good reason; God and His truth alone was the final authority. Subjects are required to obey rulers as they obey God. She accused him of raising the sword against her; a thing not condoned in Scripture. He replied with an illustration: Suppose a father takes out a sword to slay his own children, this father would be thought delusional and ought be DIS-armed and imprisoned until he returns to a right mind. It would be right for the children to rise up against their father in such a case. Mary realizes that Knox essentially has more power than she has to influence her subjects. She contends that she is not learned enough to give a defense of her Roman Catholic faith. Knox informs her that the doctrines of Rome cannot be found in the Bible with any simple reading of it. In fact, Rome has only responded to open debate with threats and violence. As their meeting concludes, Knox extends a blessing toward Mary, to rule "as Deborah ruled in Israel, pleasing to God." Such a blessing seems to have been too late. Mary had already lived a troubled life. Earlier, Henry had annulled his marriage to Mary's mom. Furthermore, Henry forced parliament to rule that Mary could never ascends to the throne. A later wife pleads for reconciliation, which Henry agrees to, with the condition that Mary endorse him as head of the Church of England and that she agree that he rightly annulled his marriage to her own mother. Now back in the court, Mary took quick action after Henry's son, King Edward VI, died at age 15. She executed her cousin, Jane Grey (the first ever queen of England, who ruled for 9 days). Mary reinstated her parent's marriage and took the throne. But her maneuvers made her unpopular: Her reversal of Henry's Protestant reforms, her marriage to a Spaniard, and her "heresy laws" that led to the fiery executions of over 300 Protestants -- for all this, she earned the moniker, "Bloody Mary." Mary endured many false pregnancies; her Spanish husband spent little time in England. Her alliance with Spain propagated military conflicts and historic defeats to France. At age 63, she died leaving no heir to the throne and leaving England compromised. Her Protestant half-sister, Elisabeth assumed the throne. During Queen Elisabeth's reign, England was elevated as the undisputed world power, producing an historic legacy that continues to this day. 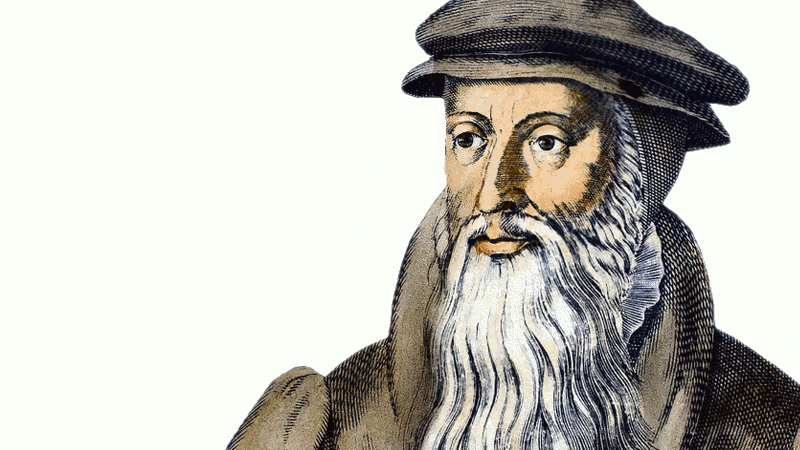 Although he brought blessings in his obedience to God, John Knox resisted and rebuked the devices of Queen Mary. We are in similar times again -- May we obey God above all!